Again, after on the left, and before on the right. Before you go omg, this for sure isn't a show car, and just my car to run around in, if I had the $$$ I would love to restore, but for now, I just maintain it. But I still love old cars, and really enjoy what some of you have done with these soon to be collectible 1987 Oldsmobiles. For the first 19 years of it's life, it was in the same family, so I am like the second owner. It looks good for a 24 year old car. It still has the original Oldsmobile 90th Anniversary book that holds all of the Olds booklets. Also an original pen and Oldsmobile Road Atlas. The logo on the pen reads, Oldsmobile Quality, Feel It! Thanks for looking at my Oldsmobile page! 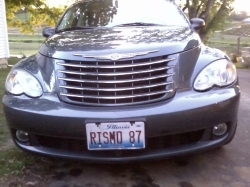 Sept. 2012 SOLD this car, check out my new page with my new PT Cruiser Horrah,yahoo! Just can't contain myself! The Old's gonna be 26 years oldin Jan. 2013! Are we a classic now? A milestone? I know, probabaly just an old car! But,still book'n up the hills and hit'n 70 mph with ease, go Grandma go!!! Knock on wood, nothing to fix this summer on the car, but I know it will be needing a new ignition thingy? you know, the thing you put the key in, sometimes I have a really hard time getting it to turn, that will be a spring project I guess, as this Old's pretty much hibernates in the winter. The only time it runs in the winter is when the "new box, (mean van)" won't start in really cold weather, :) and husband has to submit to lowering himself to the old Olds, I don'know, always makes me smile for some reason.... :) You all drive safe, have a safe winter and don't drink and drive this New Year Eve! Summer of 2011 had arrived in the midwest and it had been hot. This poor Oldsmobile, it just can't retire! Our newer "first car" sorta bit the dust, the flywheel broke and a few other transmission problems. Now what? Fix it? (We fixed it) Trade it in? Don't know, only one more payment!! How did it know? Anyways, the old 1987 Olds has now been recommissioned as the "first car" again, no longer the second car for it. It just keeps on going, I think, if it were possible,this Oldsmobile has a very happy outlook on life! At least for the time being, it must feel pretty important! Have a safe summer! JUNE 2011 Newest thing that went wrong. Ever put your brakes on and have no brakes!! Panic time! Well that's what happened, good thing I was backing up slowly, the pedal went to the floor, it stopped, but barely. Problem? The brake line broke!! So now there is new brake line.Screeching sound:This summer, (2010) the car has come up with a new noise, at first only sometimes, now pretty often. It seems to be in the driver's side front wheel area, almost a "screeching" sound, especially when I turn the wheels to the right, does anyone have any idea what it could be? Well, no one guessed, most thought it was the brake pad, not.....my rotar had two cracks in it!!!! I was informed, it was because it was the kind made in China, poorer quaility, oh well, live and learn And, do you believe I lost that little center hubcap on this car, and found it 6 months later in a corn field about a block from my house! I was just about ready to buy one, at $30, (that's for just one) and these center caps are small! Then I was out for a walk, and for some reason decided to walk along the edge of the newly planted corn field, I couldn't believe it! There was my center hubcap! What are the odds! So it has been reunited with the car.These are the things I have had done since I bought the car in Oct. of 2006 It's probably not worth it, but there is no car payment at least. 1. New front struts put on, new springs in front too, 2. lift window motor was just re-oiled and now works great, 3. front brake pads, rotors, cliphers (2007) 4. cruise control fixed, 5. tune-up, 6. new battery. Oct. 2008, 7. I had new gas lines put on as there was one spot where it was seeping. 8. I had the transmission lines replaced. Ever see those long line of streams on the pavement? That's what happened to me! I left a trail of transmission fluid. 9. Fall of 2009 a friend of mine that is also a machanic and welder did some work on the muffler system, it is now finally quiet. 10. New power steering lines11. Spring of 2010, new master brake cyclinder, 12. brand spanking new radiator 13. new oxygen sensor. Oh, this year is known for being a split year, 1987/1988 parts. The replacement radiator was for a 1988 Oldsmobile.